Toyota's wildly successful MPV, the Innova, recently received a major update in the form of the Innova Crysta. The Toyota Innova Crysta launched with two engine options, a 2.4-litre and a 2.8-litre engine, both of which burn diesel. 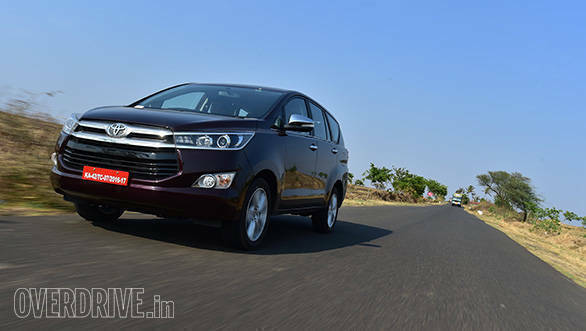 However, due to the diesel ban in Delhi NCR as well as Kerala, the sales of the Innova Crysta have taken a hit. In order to counter this, Toyota is now developing a new petrol engine for the Innova Crysta, with plans to launch this variant around Diwali. The new petrol burner will be a 2.7-litre unit and is currently under development at Toyota. Development has been expedited as the R&D department is working in conjunction with Japanese engineers. However, what's puzzling is that Toyota is already selling the Innova Crysta with a 2.0-litre petrol unit in Thailand and Indonesia, so we are unsure why the company isn't bringing that engine to India. Reasons for that can vary, ranging from inadequate power and economy for the Indian market, all the way to not passing emission standards. As for the pricing of the petrol variant of the Toyota Innova Crysta, it's currently hard to speculate since the engine is currently India specific but could branch out at a later time, resulting in reduced prices. Currently, prices for the Toyota Innova Crysta start at Rs 13.88 lakh for the 2.4-litre variant all the way up to Rs 20.78 lakh for the top-of-the-line 2.8-litre variant.